If you think you are not cut out to be on stage, maybe it's time you change how you think. Imagine this: You have a BIG presentation due in a week’s time. You’re not quite confident that you will pull it off masterfully. And, no matter how hard you try to buck yourself up, you end up palpitating and getting nightmares. But, you’re not alone in this struggle. Even the most confident people like the CEOs experience such nerves before they address an open house. Hence, to help you to speak in public without a breakdown, we compiled a few tricks to trick your mind into believing that presentation is no biggie if you go prepared. Read on! Practice, appropriate appearance, gestures, practice and hard work can make a difference between an ordinary public speaker and a charismatic orator. Stop making it about yourself! 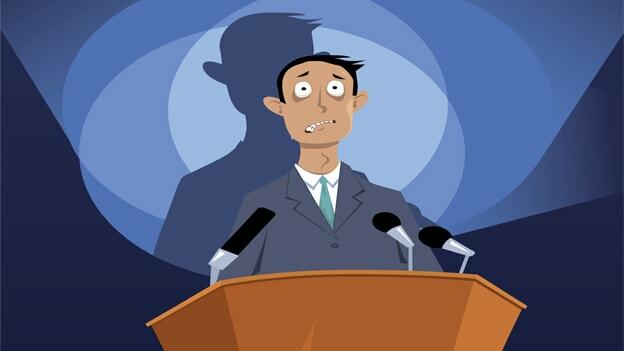 The reason we detest public speaking is that we fear public humiliation and also the prospect of not being able to speak comprehensibly and lucidly. We end up taking the entire focus off the event and make it about ourselves. “What will people say”, “What if I don’t live up to everyone’s expectations?”, “What if I get tongue-tied or just black-out?”, “What if I get nervous and ruin my only chance”? You notice the pattern here? It’s “I”. Although it’s normal to feel this way, you must get yourself out of this “what if” loop and for starters, sit down and concentrate on the presentation. You may think that learning your speech from start to end is THE thing to do, but you’re mistaken! That’s because you may risk sounding mechanical. Instead of a verbatim reproduction of what you wrote on paper, you must focus on being thorough with the substance and the main arguments and ideas of your speech. Remember the structure and the sequence. It will enable you to recall better and deliver to perfection. Even if you forget, you will be able to improvise. If it helps, you can carry a few cue cards to refer to mid-presentation. For some people, practising before the mirror helps. Others prefer locking themselves up in a room with no mirror at all. The thing is that you should find out what best works for you. Do you want someone to sit before you so that they can give you a feedback? Or, would sitting in a cafeteria, surrounded by people calm you down? It is a good idea to also record yourself on video, rewind and assess it critically. Concentrate on studying the body language, facial expressions, clarity, intonations, diction, accent and on whether you stop abruptly, look as if you’re trying to remember or think of the next phrase. Try to improve on these aspects. The best way to become question-ready is to prepare a list of questions that people may ask you. Start by examining every slide, jotting down the smallest concern people may have. Once you’ve done that, get down to formulating answers. This way you will not only be ready but also won’t freeze when someone from the audience sends a volley of questions right at you. When you take the centre-stage, give yourself enough time to catch your breath. Inject humour to wake up the sleepy heads. Take a sip of water. Most importantly, move around if there’s enough room. A very good idea is to watch the speakers on TedTalks. They all keep moving and engaging with the audience. You can also break for a pause so that you get time to skim through the rest of your presentation or chat up with members of the audience. Besides, use hand gestures to explain a point. Above all, be kind to yourself and learn from your mistakes. There’s nothing that an experience cannot teach you!